The original published in January 1934 was titled Shin Fuseki-hou and subtitled ''Go Revolution and The Application of Hoshi, San-san and Tengen''. The authors were listed in the order Kitani, Go Seigen, and Yasunaga. The board on which Kitani expounded his ideas at Jigoku-dani has been preserved and is signed by him underneath with the motto Ninpuu (Benevolent Wind). The modern (1994) edition has authors in the order Go, Kitani, Yasunaga and has additions, including a new preface by Go. In it he says he spent 3-4 relaxing days in Hell Valley and sat at the side of the board while Kitani expounded to Kohara Masahiro. He was 5-dan and now taking White more and wanting to move away from the trusty Shusaku 1, 3 5. For White he admired the play of Shuei. It was when he was 5-dan that he began to think seriously about playing 1 or 2 moves in the corner. As soon as he became 5-dan he played 7 or 8 games as Black using hoshi or san-san (his first was Game 170, nirensei v. Kitani in Feb 1933). Of those where he played two hoshis he won almost all (actually all); in those where he played san-san the results were not what he hoped for (he beat Kitani with nirensei in Feb, beat Kitani with cross hoshi in March, Iwamoto with cross hoshi in March, Miyasaka with cross hoshi in March, Fukuda with one hoshi in March, Shinohara with one hoshi in April (Shinohara played san-san! ), Onoda with one hoshi in April (Onoda played san-san), Hayashi with cross hoshi in April, lost to Hasegawa with double san-san in May, beat Kubomatsu with nirensei in June, lost to Kitani with double san-san in June, beat Kitani with double san-san in August, lost to Kitani with double san-san in Sep; in this period he also played traditional komoku). He was trying to finish off the corner with one move. Before he went to Hell Valley in August he lost two games with hoshi and san-san (this does not square with the collected games, even including White and the match games; he lost only with double san-san). Though he started with different ideas from Kitani, listening to him he absorbed some of his feeling that it was necessary to stress the centre. He had none of the philosophical basis described in Yasunaga's book. His first game after Hell Valley was with Shinohara, published on 21 Sep. He was White and played two hoshis and takamoku. That was the first time he felt he was playing New Fuseki. Go Seigen said Yasunaga wrote the book almost in one evening, and it "seemed" to be a bestseller (implying Go did not know for certain, therefore was not paid royalties). Looking back he now views Yasunaga's theories as simplistic. There is too much emphasis on frameworks and not enough on territory, which is one area in which Go's A Way of Play for the 21st Century differs. He also tries now to stress the whole board more. Go has been revitalised after the war by the input from Chinese and Korean pro Go and worldwide amateur Go. (His six harmonies - NSWE etc maybe hints at that). He thinks Japanese Go has suffered from joseki poisoning and the reason Korea and China have overtaken Japan is that they take a more whole-board view. This is a joint preface by Go and Kitani and begins: "The fusekis that we have been trying lately seem to have caused something of a sensation in the Go world because they are rather different from traditional fusekis. This explanation of how they arose and what they comprise is about to seek the esteemed approval of the reader, but it does nor mean that there was no motivation for the fact that this new way of playing fuseki suddenly appeared just last autumn in our two attempts. Indeed, for some considerable time before we harboured doubts that traditonal Go had become too trapped in forms." They explained that traditional moves such as shimaris were in some way biased and for stones to have their maximum efficiency any early bias was bad. The word for bias hen-katayoru? is made much of. They quote the very first sentence of the Confucian classic The Doctrine of the Golden Mean (Zhong Yong), where this word is used. It says "Being without bias to either side is called zhong (a word that is now used for "centre"); not changing is called yong." Both terms are the subject of much comment by later scholars. The great Zhu Xi said, "Zhong is the name for what is without bias, for what is not strange, for what does not exceed and for what does not fall short." It has been well rendered as "equilibrium." The meaning of the word yong is rather contentious and ranges from "using" to "harmony". The emphasis has thus settled on zhong, and the emphasis on the centre in new fuseki may be seen as inevitable (though perhaps a form of bias, too!). Incidentally, it is in a couple of sentences further down in this work that the phrase rikugo occurs. It denotes the four cardinal points plus the zenith and nadir, hence the universe. It may be a subtle hint by Go Seigen that the golden mean is to be taken on a step. The sense is: unroll the principles of the golden mean and it will fill all corners of the universe. "Revolution" was his word for what happened in the Autumn Oteai (Go Seigen and Kitani's games), but it was not a rejection of traditional Go. He saw Go theory as a pyramid, with tradition as the base. A phrase that was in the air at the time was Showa Ishin (Showa Restoration). He says he followed four principles: 1. Lack of rhetoric and fancy phrases (he totally failed); 2. Many diagrams (to go straight "from the eye to the brain"); 3. Small octavo format to make it easy to carry on the train and to make it less likely to end up as tsundoku (reading matter piled up unread); 4. Examples taken from actual games. Kikuban = small octavo = 636x939mm, giving a book size of 152x218mm, i.e. close to A5. It came in before the war, therefore this was an early example. It was brought in by newpapers in 1882 and was stamped kiku, chrysanthemum, though the real meaning was kiku as in the bun of shinbun. Newspapers influenced life as much as TV today. Symbol of change. A brief but useful survey of past developments in fusekis. He starts with the Nara period though there is nothing sensible to say until Nakamura Doseki (1582-1630) who was the first to discriminate properly between the corners, side and centre. He was the first to give priority to the corners. Dosaku (1645-1702) is next. He gushes about him. One of Dosaku's innovations was tewari theory, a way of assessing the efficiency of moves and from this determining also the correct order of moves. He reproduces a table from Zain Danso that shows how far above his best contemporaries he was: -B - to Santetsu and Inseki, 2B to Chitetsu and Shunchi, -2- to Hayashi Monnyu. Neverthless, apart from tewari he did not add much at a macro level to Doseki's fuseki theories. Tewari tended to be limited to local issues. However, he did start to use the three-space pincer as opposed to the one and two-space pincers that were normal hitherto and this can be seen as the germ for the ideas of New Fuseki. Dosaku clearly grasped that Go is not about local fighting, which is what the one- and two-space pincers implied. He broadened the game. Other moves of his show that he was trying to achieve a balance over the board as a whole. What Go in his day lacked was any sense of using the fourth line. They emphasised solid bases on the third line and left the notion of setting up commanding positions (influence) till later. This is the meaning of being "slow". It was at this time that Yasui Santetsu tried tengen against Dosaku (he was probably influenced by being Astronomer Royal, as Shibukawa Shunkai) rather than trying to advance Go theory. But playing at tengen was later a major feature of New Fuseki development. The next major contribution was seen in the games of Yasui Chitoku and Honinbo Genjo, in their early days in the Bunka era (1804-18), when early moves on the fourth line began to be seen (though not as early as the first few moves). Doseki gave the corners prominence. If Dosaku can be seen as adjusting the balance with the sides, then Chitoku and Genjo adjusted the balance towards the centre. Fuseki development since may have stagnated because of the solidity of the advantage of first move, an aversion to change, and (a strange one this - may have reflected a debate of the time, as with another Yasunaga usage form v. content) all branches of scholarship relied on the deadhand of deductive reasoning (a priori arguments, syllogisms - Go is player by clever people; I play Go, therefore I am clever). There were major developments in Go as a whole of course. Late Meiji and especially Taisho was when major advances in endgame theory were made. (Put this in Kamakura game) As a famous but quite possibly apocryphal story of how played out fuseki was in early Showa, Nozawa Chikucho 7-dan was seen in earnest study over a Go board with another famous player. His students were anxious to know what he was doing and gingerly approached and asked. He told them that he had studied almost everything there was to study about fuseki, but one of the few things left was the two-space high approach move (the one used by Go Seigen) to komoku. He had a hunch his opponent in the Oteai the next day might play it, so he was preparing. The students thought he was mocking them, as however strong their teacher was, he couldn't predict what his opponent would do. We are invited to imagine their astonishment the next day when White played precisely as Nozawa predicted. Yasunaga made the point that new Fuseki was not a sudden invention, but has evolved and it reflected the difficult social conditions of the time (which he did not enumerate). He uses the phrase "making previous locally bad moves into good moves strategically." He used a clever phrase for Juuroku Musashi, musashi being written "lack three four" (i.e.no komoku). In numbers, if we say a shimari is worth 4 in the corner, a hoshi or san-san is worth 2. A shimari needs two stones, but if a stone was added to hoshi or san-san, the combination would not be worth 4, but 3. But there are misgivings when we look at which shimari to play. In Diag 13, Black can play A, B or C, but it is a local decision only - none of these moves can be said to be influenced by White 2. This is unsatisfactory; there should be whole-board balance. Each shimari in fact has a bias. In Diag 14, the extra black stones cannot mask the fact that there is a gap at A, which results from the bias of the shimari. This in turn constrains the player who must only makes moves that make the shimari work effectively. It deprives him of freedom. Looking at it this way brings into question whether shimaris really deserve precedence. The sides are next in priority to the corners. But where to play? In Diag 15 D does not feel as if it is controlling territory as White can play a, b, c or d. So if territory is the criterion it has to be A, B or C.
In Diag 16 A is the most secure but its territory is very small. It can regarded as reducing one's own territory. It feels like san-san in the corner. B is the Golden Mean. C is too high for territory. Therefore the third line is the line of territory on the sides. But it has a drawback. In Diag 17 A and B have the same number of stones but B surrounds 28 points and A 18 points. As the number of stones increases, so the advantage of the third line decreases. C and D show the same effect even with fewer stones. Although the third line is best for certain territory, it has no adaptability. For this the fourth line and fifth line are best on the side. They may not represent territory now, but have potential for it in the future. Moves rich in adaptability have no bias. The most versatile move is tengen, but we cannot say it is the best move, because Go has other constraints such as life and death. One of the fundamental reasons for New Fuseki is to address this question of potentiality of territory. In Diag 18A, the territory is about 45 points. In 18B its about 33 points. But the number of stones is the same. A also works better to the right with its wall of five stones. 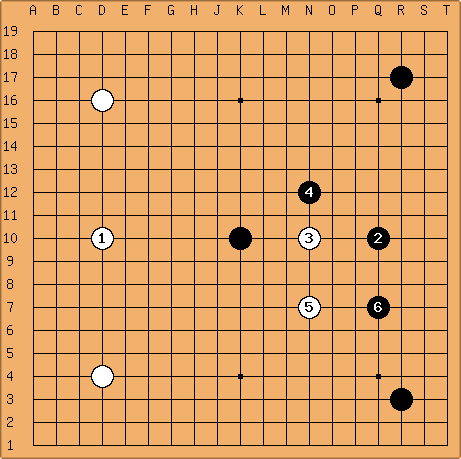 In Diags 19 and the box development from the ikken shimari is better than the tray for this reason, but also if viewed in terms of follow-up moves or by considering the removal of the komoku stone - with the box development, invasion in the corner by White still results in a box shape territory, unlike the tray development. To summarise so far: (1) Shimaris may be biased and therefore disadvantageous; (2) Ditto the third line. Therefore Go based on the principle of certain territories denies the organic whole and is nothing more than a collection of small, local battles. New Fuseki seeks the whole. But it is still abstract and needs experience to implement it. This will rely on the theory of equilibrium or "averaged" plays. Tengen has the most equilibrium, acting equally in all directions - see Diag 21. A point such as A on the lines AB or CD is next. It has symmetry in four directions (diagonally and orthogonally). But points on the line ab or cd only have symmetry in two directions. The theory of equilibrium emphasises symmetries. The diagonals (Diag 22) are therefore the most important, having the most symmetries. From that point of view all points on these diagonals have the same value, but such abstract statements make no allowance for the life-and-death constraints of Go, etc. Experience tells us A and B in Diag 23 are bad moves. New Fuseki does not disregard the corners. It simply queries whether the shimari is the correct way to deal with it. In Diag. 24 A is an important point. Therefore to occupy it first has repercussions as to what happens on the outside. The moves to consider are therefore san-san and hoshi, definitely, and to some degree 5-5. 6-6 can be regarded as too far from the corner. Hoshi is in the corner but does not guarantee its territory - proof it is unbiased. It can be seen as the ultimate equilibrium move. San-san is biased towards the territory so is inferior in this respect, but it has other important aspects. 5-5 is biased away from the corner, but it certainly still affects what goes on there. And it can be regarded as more versatile than hoshi in affecting what goes on on the outside. A shimari from 5-5 at either of A in Diag 26 (5-3 point) is not as biased towards the corner as the usual shimaris. And unile hoshi and san-san, 5-5 does at least offer a shimari. The shimaris from 5-5 need further study, but one benefit of 5-5 is that the shimari can go in two directions. Further, because the opponent is, early on, unlikely to want to invade behind 5-5, it is less urgent to play a shimari than with conventional openings. If the opponent invades against 5-5 at 3-3 or 5-3, the 5-5 stone acts as a cap. Furthermore, if the 5-5 player ignores the invasion, the invader has no strong follow-up against him. 4-3 is different: the 5-5 player would not like the invader to follow up with keima at 6-4. So he will press at 6-3, forcing keima at 5-3. Normally playing this shimari, biased towards the corner, and letting the opponent have two moves in the wider areas of the board is bad. But here it may be less a question of bias than playing in an important corner, and so it would be only a relative loss. Assuming a shimari at 5-3 for the 5-5 player (Diag 29A), which side is best? The side where there are friendly stones, eg A in Diag 29B (same as [ikken shimari]). The hoshis on the side have a similar significance to those in the corners. In Diag 30, therefore, A corresponds to san-san and B to 5-5. But an extra dimension of the side star is its position of equilibrium between the corner hoshis. It is too abstract to say tengen has primacy when there are hoshi corner stones. From the viewpoint of equilibrium we can consider Diag 31. Point C, not tengen at O, is the point at which equilibrium of distance is achieved (AB = BC = CA). But this is all too abstract and not practical. A stone on the side hoshi at D is. The average of three moves is shown in Diag 32: with stones on ABC it is O. The above has considered moves of just one colour (equilibrium based on averaging), but there is also balance between Black and White. Balance can be divided into local and overall. The former is normally assumed to come down to joseki, but all josekis depend on the overall context so we cannot talk about balance in local josekis. (An example follows - Diags 33-35). Maybe we should forget about traditional josekis. New Fuseki certainly doesn 't use them (partly because hoshi is so common). The groundbreaker in realising the concept of balance and use of hoshi was Honinbo Shuei in Meiji times. He often played 2 in Diag 36. Black 3 (ikken shimari) became a common countermeasure. It is interesting to consider why - it was clearly intended to match 2 for influence. It is often said Shuei played no unreasonable moves. His games flowed smoothly, and that was because he stressed balance. This is why later players call him the Meijin of Meijins. He played quickly and appeared not to think even in positions that others though difficult. One senior player said he just looked for the miai. If the opponent played one he just played the other, without thinking, but in such a way as to create two other good points. Balance changes according to context. In Diag 37, 1 is in balance, but in Diag 38 the presence of the threatening white stone means 1 is better balance. In Diag 39 the balance shifts to 1, not A (to stop White developing towards the centre and so negating the sanrensei). A local loss can be accepted if it creates better balance overall. Cf Diag 41 and the Ref. Diag. If there was no keima cap as in the Ref Diag, Black would answer the invasion with 6, not a kosumi. So Diag 41 is a loss - but it works overall. In practical terms three concepts must be borne in mind when playing the fuseki: (1) Connectability of stones; (2) Direction of play; (3) Lightness / heaviness of stones. In the case of connectability, distance must be considered. Where stones are diagonally connected (kosumi) they are harder to cut because the true distance is a Manhattan one. Therefore the effect on the white stones in Diag 51 is less than in Diag 50. Direction of play is towards the areas with most development potential. Therefore the ideal way to play is to create as many development areas as possible. The sense of heavy here is of a stone that has poor potential for development. In that sense tengen is the lightest move on the board. Hoshi stones are also light. (Rather unconvincing chapter) A practical balance between territory and influence. There are differences between sanrensei for Black and White. The discussion here relates to White - Black was already considered and his priority was balance. Also White needed new measures more than Black because of lack of komi. For White it is a matter of making Black fall behind (i.e. speed) through overconcentrating himself on one side with old fashioned shimaris. Described as a starting point only for their researches, this was an attempt to compare an old style opening for Black against the new sanrensei for White. The name 1-3-5-7 was coined only for convenience here - it was R16, D15, P16, Q10 for Black. They make the point that the advantage of first move is such that Black can even make a bad move and still get a satisfactory position. Here the shimari has a weak point locally and the D15 stone leaves the corner open. But White cannot yet do anything significant - to play at D17 would allow Black to press him into the corner and so negate the strength of the sanrensei. Therefore D17 is not even urgent for Black. Yet objectively it must be bad to leave the corner open. 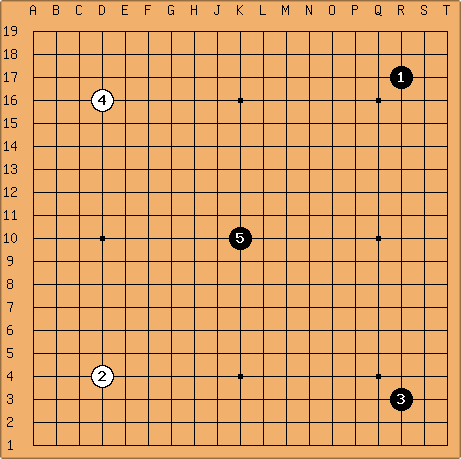 A long chapter on new fuseki shapes that appeared in the Oteai (the main tournament). Game 1 is Kitani v. Takahashi Shigeyuki (Kitani 290 - Takahashi (B) won by 1). 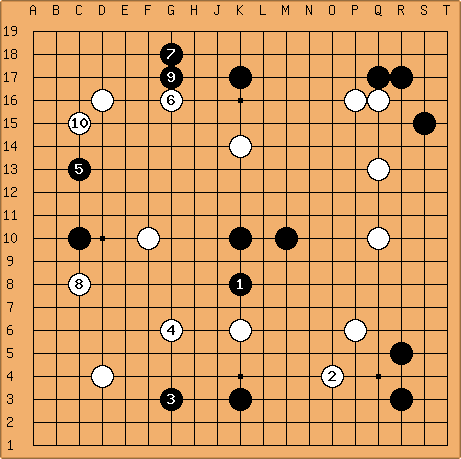 Game 2 is Go Seigen (White) v. Kosugi Tei in 1933 (GSG Vol 1 No. 191) (the unusual opening on the New Fuseki Era page). As an example of the thinking involved the commentary on this opening (the bulk of this chapter) is given. Game 2 starts R17, D4, R3, D16, K10. This tengen move is the main point of the discussion. Yasunaga says that it is obvious that a move to counter or negate the influence of the two white hoshis must be on the axis A10-T10. But 5 is wrong. It should be E10. C10 would be bad because White can cap it, and since he also has pressing moves against the two san-sans he will secure the initiative. D10 is bad for similar reasons and also has the drawback of having a thin base. E10, however, can meet a cap at G10 with C10, which gives a base and also a platform for Black to counterattack the white cap. Black 5 at Q10 or R10 would contradict the san-sans and would lack power overall, being in unbalance (to turn it round, if he played Q10 first he would want to play Q16 and Q4 to secure overall balance). Nevertheless, given the position of the game, if Black can play next he would find that Q10 does secure balance and the san-sans are then perfectly placed to deny White's invasions. That seems to make White's next move obvious (Q10), but there is a brief digression to consider what happens if White plays sanrensei at D10 instead. ...but in the game, after White Q10 Black played C10 and White capped at F10. This was premature. Had Black played C10 at D10 then White G10 would be perfect, as a Black play there would be just right. But with 7 low at C10, Black is hardly likely to play F10 or G10 himself as that is bad shape. So White could have diverted to K16 or K4. Black next played 9 at K17 followed by White K14, Black K3, White K6. Black's territorial ambitions became clear, and with the exception of tengen contradicting the san-sans he has apparently achieved a splendid structure. Even so, his K3 is questionable. It was too urgent to reinforce his tengen stone. The suggested move was K7. In the game he had to play 13 at M10, but already he was running out of room. White's next, 14 at Q16, was criticised. It defines the play too much. O10 was preferred to see which way Black will move. Then if Black M13 White could play L16 to attack the stone at K17, leaving Q16 as a threat. Now that White has played Q16 (followed by Q17, P16, S15, Q13), Black will certainly not play at M13. It is more efficient to find which way the fish are swimming before you cast the net rather than cast it and hope the fish will oblige. Black now defiantly played 19 at R5 - a psychological move. White played P6 and Black K8. Black decided to try to settle himself small but quickly rather than run and let White keep blocking him. White then played 22 at O4 - the local point of balance of Black 11, 3 and 19. If White omits 22 Black will play there (it adds a note that if White 20 is not there, the point of balance shifts to N4). Obviously 22 also aims at the black centre group. However, does it make sense of all of White's previous moves? Overall balance is more important than local balance (i.e. local profit and loss). This game is a good example of that. Therefore White 22 should be at M6 - the centre attack is most important overall. We are asked to consider White 22 at M8. This is much more overtly aggressive, and not good because Black settles himself at once with L7, L4, M7, L3, N8, but at least we can see how White can easily make local profit on the lower edge. Black 23 had to be G3 otherwise White plays H3. White 24 at G7 was partly cover the thinness in the lower left corner. Black 25 (c13) was here and not C7 partly because Black has no stone at G17 yet and so offers indirect help, but also he has 23 in place which means there is not a lot to be said for White playing C7 (i.e. it is not urgent). However, if the stone at 23 was a White one, Black 25 would be better at C7 to forestall a White move there. White played 26 at G16, still aiming at the centre but also at M17 next - hence Black 27 at G18. But 28 was not urgent as long as the point was open, and so he should play M17, aiming at miai of connection with M14 and watari with Black 15 (the idea of watari is to settle 9 quickly, which was the point of 27). White 28 was C8 - the last big point. Since it aims at attacking 7 and 25 it also by implication aims at attacking the centre as a follow-up. Black 29 next at G17 was slack and in the wrong direction. Since there are no big points left and Black has secured solid bases for himself on the edges, he should take the opportunity to switch to the centre and play moves such as K12, H10, N8 or L9. W won w/c after 156 moves. This was the famous 16 Soldiers Game, though not called that here. Yasunaga later used the phrase musashi with kanji meaning no 3-4 as a clever pun on no komoku. In his very next game Go used a similar idea to Black by playing 1-3-5 at san-san tengen hoshi v Honinbo Shusai (Game 192). Game 4 was Kitani 5d (B) v. Kato Shin 7d. (Kitani 295) in the 1933 Oteai. The old version ends here apparently. The new version adds biographies of the three authors and a further selection of fusekis. Then Shirakawa adds a chapter on New Fuseki as the starting point for 21st century Go.